The Russian propaganda machine produces endless streams of fakes and manipulative stories. While at times they may seem outrageous or silly, they are far from being random. 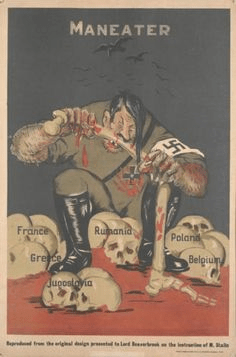 Russian propaganda for both domestic and foreign audiences follows techniques that stem from Goebbel’s times. Ultimately, it is a weapon of war. In our series A guide to Russian propaganda, we examine how propaganda works, and how one can avoid falling for it. Russian propaganda for Russians has a very different tone than the stuff the Russian state serves up to foreigners. This is partially because they serve very different purposes. The Russian state lacks the ability to coerce foreign populations (well, outside of occupied territories) and therefore propaganda is mainly a tool of division. Russia tries to persuade western audiences about Russia’s reasonableness, create grassroots or even political lobbies for pro-Russian positions, or sometimes just confuse people and muddy the waters about key issues. Russia’s rulers use propaganda in Russian to direct their populace, squash dissent, and instruct them in the core political beliefs that Russia’s rulers find most useful. One of most useful ideas they push on their populace is a particular Russian form of anti-Americanism. 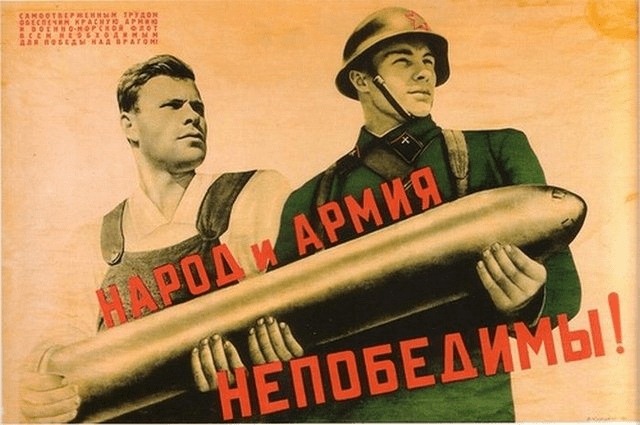 The use of anti-Americanism may be partly the result of Cold War propaganda, but even if the Russian people totally forgot their Soviet indoctrination, Russia’s current rulers would probably use the same idea. 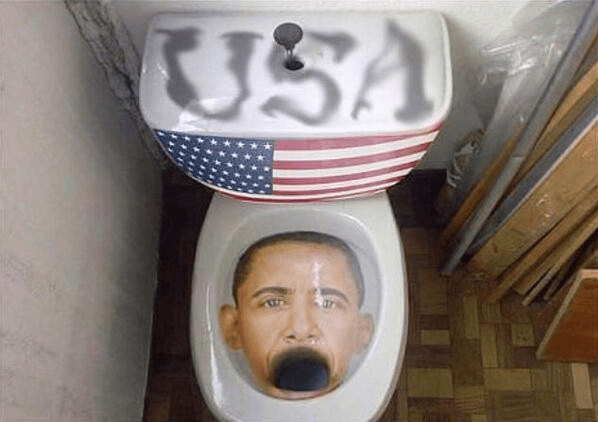 As America is the most powerful nation on earth with a tremendous amount of cultural influence, it is the perfect candidate for the role of the villain in paranoid nationalist propaganda. Below are examples of propaganda and an explanation of the role they play in influencing the Russian population. To make sure that Russian audiences will consume propaganda without asking too many questions, Russian media bombard their audience with falsified or invented reports that aim to disable critical thinking. The most cynical means are used to achieve this result. Propaganda employs methods of psychological manipulation which are designed to reduce dramatically, if not to block entirely, the ability of critical thinking on the part of the viewer or listener through an appeal to his or her feelings. Hatred is not necessarily always the feeling sought. Propaganda actively exploits the feeling of pity: in so doing, it plays not only on the worst but also on the best human instincts. It does so, for example, by showing ruined residential buildings in the Donbas, or children who are suffering from the effects of war. 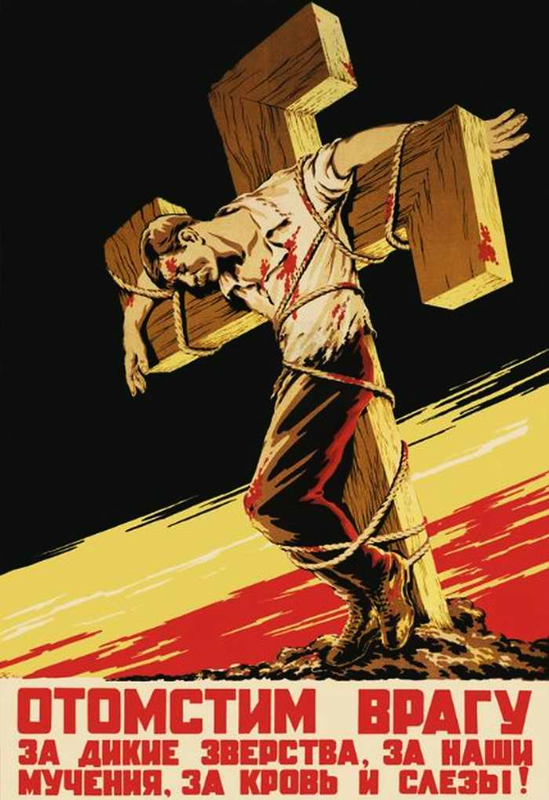 In propaganda, there is no hesitation to resort to open lies: it is sufficient to recall the story about “crucified boys,” purportedly macerated by the Ukrainian army, and other similar subjects. The characteristic that distinguishes propaganda from regular reporting is that the person who is experiencing feelings of pity, pain, fear or “righteous anger” is not given the opportunity to think rationally about the subject that has elicited such feelings. 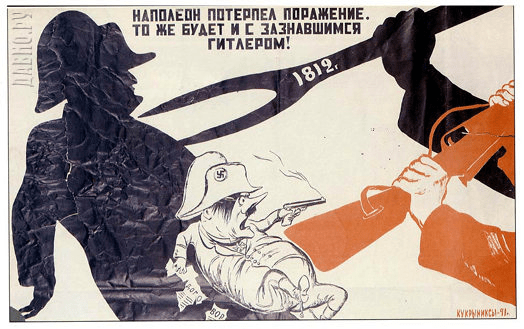 He or she is given a prepared response, and a prepared image of the enemy – “punishers,” a “junta” and the Americans who back it, “destroyers of the civilian population.” More often than not, Russians are slipped a veritable cocktail of emotions intended to block the very ability to think during the time it takes to process the information. Examples are the horror of war, pity for the victims, fear that can reach proportions of panic, and the dread of an impending military threat. The importance of the evil, powerful, crafty enemy in Russian domestic propaganda cannot be overstated. This enemy justifies the immense reach of the Russian state into Russian civil society (how else to defend against the vast American conspiracy?) It also ennobles the Russian people and their leaders and the sacrifices they must make because of Russia’s aggression. Russia has not invaded Ukraine and Russian troops are not murdering Ukrainian citizens for the political defense of Vladimir Putin, Russia instead reacted preemptively against the American plot to destroy Russia. A foreign observer of Russian propaganda may be surprised to find out how American personalities and policies are characterized. The supposedly all-present enemy can be used to deflect criticism away from Russia’s rulers. Problems and political opposition are caused by external conspirators. By adopting the official foreign policy rhetoric, the average person compensates for his or her own helplessness through the illusion of involvement in historical events and a link to the abstraction called “Russia.” Understanding the essence of foreign problems is far more complicated for the average person than understanding domestic issues. More often than not, such Russians have never been abroad, and do not know the actual attitudes of western countries. For this reason, such Russians are easily subject to manipulation, in this case leading them to blame external enemies for their own problems. 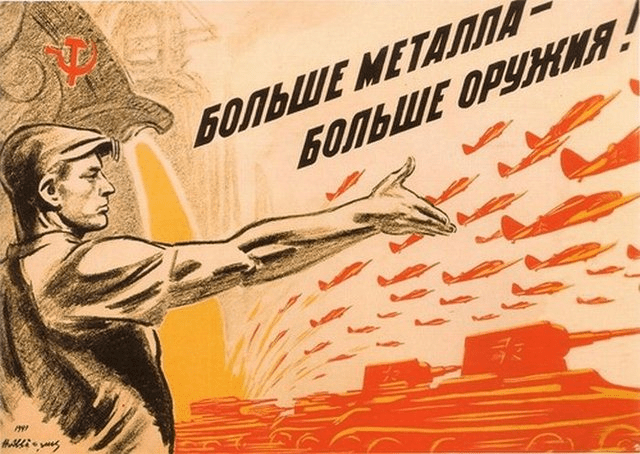 Russian propaganda exaggerates the importance of preparing for a supposed war with the West. Of course, this means that anyone pro-Western is a potential 5th column. Call for consolidation are done at different levels and with different connotations, ranging from aggressive calls to fight against the “national traitors” to constructive attempts to unite people in order to solve problems, but only in the case of their total approval of the foreign policy of the authorities. The necessity to consolidate is enhanced with repeated messages of supposed danger emanating from foreign secret services and their agents, the Russian opposition. Putin is presented as a strong leader who is solely capable of stopping the evil conspiracies of the enemy. Commentators have called the cult of personality surrounding him to “exceed Stalin’s by every measure.” The endless militaristic dangers and threats shown to be emanating from all directions create the need of a strong leader that will save the populace from the impending catastrophe. In reality, it is Russia that invaded Georgia and Ukraine, and which is supporting aggression in Ukraine with weapons and personnel for Russian-backed separatists in Donbas. Despite these facts, Russian media manages to cover events in a light which make Russia appear as the victim and not the aggressor. Plunging the consciousness of the population into an endless militaristic hell and frightened them with the constant specter of imminent war (including nuclear war) makes it possible to justify any hardship or deterioration in the economic situation in the eyes of the population. The threat of an impending nightmare will make people accept any other deprivation as a “lesser evil,” or as a sacrifice that must be made to avoid war. 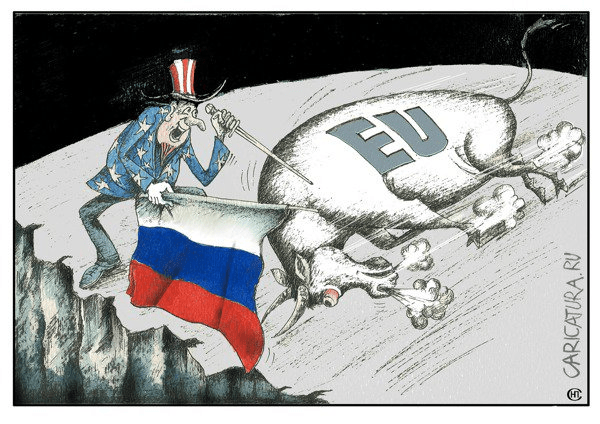 The West is given the impression that Russia is united and prepared to fight. This improves Russia’s ability to engage in brinksmanship. Whataboutism is alive and strong today in Russian propaganda. The basic mechanism is an attempt to use either the emotions of shame or anger to derail an argument. By accusing their opponents or even just their interlocutors of hypocrisy, propagandists hope to trigger the emotion of shame to blunt accusations or divert the conversation into a discussion about hypocrisy. If the counter-accusation the propagandist uses is absolutely ridiculous, as is often the case, then the propagandist is probably not trying to use shame, but rather use one’s anger to divert the conversation away from an important matter at hand and into a constant back-and-forth about some irrelevant piece of history. Remember, the propagandists want to keep you distracted and confused. They don’t care about facts or truth, they just want to mentally divide and weaken their audience to make them more susceptible to propaganda or irresolute in the face of aggression. Don’t get derailed – the propagandists are probably twisting facts to suit their narrative. 1. 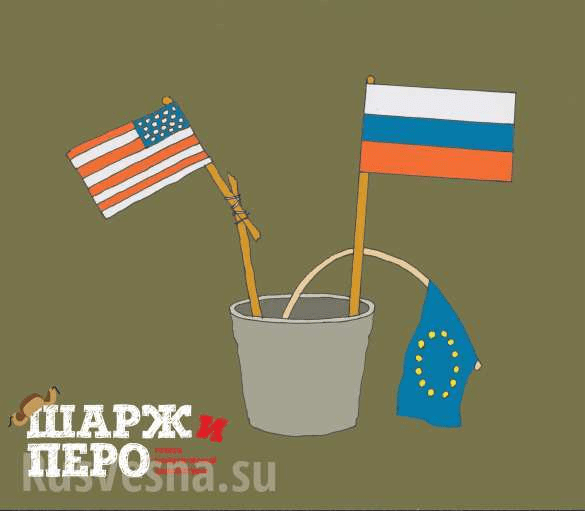 Russia is not invading Ukraine and besides, what about the US hypocrisy in telling Russia to stay out of Ukraine? This Russian propaganda clip from March 2014 tries to change the subject from Russia’s then-ongoing invasion of Crimea by attacking US hypocrisy. While Russian troops were invading Ukraine, this clip attacked the US for invading Iraq, fighting in Afghanistan, and using armed drones, all while denying that the Russian invasion of Crimea was actually taking place. Notice how the item concludes with the statement “actual military action has not even been given a green-light for by the Russian President, and Russia never said it’s interested in war with Ukraine. Regardless, the world’s top aggressor accuses Moscow of being one, applying double standards upon convenience.” In fact, Russian troops had seized Crimea several days before this clip aired, and Russia began also invading Donbas a little over a month later. 2. The “Rebels” in Donbas are organized and violent and it looks like they are being coordinated and supplied by Russia? What about the organized protests months earlier in Maidan? This clip is from CNN in April 2014 during the first stages of Russia’s invasion of Donbas. At one point in the clip the CNN anchor asks a Russian propagandist about the refusal of the supposedly “pro-Russian protesters” to abide by the Geneva accords lay down their weapons and leave the government buildings they occupied. The propagandist immediately switches to talking about the Maidan protests and Crimea. She says one can’t say the Russians occupying buildings in Donbas are Russian soldiers because they are armed and organized, because the protesters at Maidan were also armed and organized. She doesn’t mention the protesters in Maidan were armed with self-made wooden shields and were self-organized, while the Russians taking over administrative buildings were armed with machine guns (see other differences between Euromaidan protesters and Donbas separatists here). As proven by phone intercepts of Putin’s top advisor Glazyev, this distanced semblance to a popular uprising was crucial to the Kremlin in manufacturing the war in Ukraine by financial and organizational means. The techonology was to prop up “popular support,” ensure the relevant vote by the local authorities by means of armed men (mostly, Russians) occupying the administrative buildings, invade under the guise of providing “protection” to the local population. 3. Some of Putin’s shady financial dealings were revealed in the Panama papers. What about the other political figures who were connected to the Panama Papers? This item from Russian propaganda tries to deflect attention from the shady dealings of close Putin associates revealed in the Panama papers by changing the subject to the dealings of David Cameron’s father, and one propagandists spins that the Guardian was only emphasizing the Putin angle to curry favor with MI6. 4. Russia murdered a British subject in London with polonium – but what about the Iraq war? 5. Chernobyl is on fire, but what about nuclear accidents in the US? According to the New York Times, the Soviets provided a classic example of whataboutism in 1986. After spending days denying or minimizing the Chernobyl nuclear meltdown and fire, the Soviet government finally admitted that there was an accident on TASS, the official Soviet news agency. The brief announcement was followed by a report about nuclear mishaps in the United States, like at Three Mile Island and Rochester. 6. Russian forces participated in the Crimea annexation, but what about Kosovo? After the illegal referendum at gunpoint on 16 March 2016, Russian President Vladimir Putin addressed the Duma, equating Russia’s annexation of Crimea to Kosovo’s secession from Serbia, essentially endorsing the intervention in Kosovo. However, at the time of the Kosovo intervention in 2008, then Russian President Medvedevcondemned it, saying that “Kosovo independence violates Serbia’s sovereignty, is a violation of international law.” Just seven months later, when Russia invaded Georgia in August 2008, Medvedev contradicts himself by using Kosovo as an excuse for invading Georgia, saying that the Georgian region of South Ossetia was a different type of Kosovo. Kosovo was “bad” for Russia where there was a need to condemn the “hypocritical West,” but good when Russia needed to justify its invasions and occupation of sovereign countries. One of the ways Russia achieves national goals is by creating falsifications and conspiracy theories. When Russia wants to, it can create high-quality fakes and sophisticated deceptions with brilliant intricacy, like operation INFEKTION or the moon landing hoax. But when something goes wrong in Russia’s wars abroad, there’s no time. Quick and dirty conspiracy theories and disinformation slow down analysis and distract people in the early stages of a news story. Just recently, Russia used this tactic to hide its bombing of a UN humanitarian aid convoy delivering food and medicine to Syria, which was bombed on 19 September 2016, with 21 people killed and aid for 78,000 people destroyed. Since that part of Syria is controlled by the joint Rusian-Assad forces, the suspicions fell on Russia. First, Russia’s Ministry of Defense claimed on 20 September that a mortar was moving with the convoy, suggesting either the convoy was protecting a “terrorist” truck, or that terrorists had attacked the convoy. However, this was easily debunked by Conflict Intelligence Team, which proved the truck shown on the MoD’s video was filmed 6 km away from the bombing site, 5 hours before the incident. Then, Russia’s MoD claimed that the convoy wasn’t destroyed by an air strike at all. But it was obvious from the photos that only an air strike could leave those kinds of holes in the destroyed vehicles. Then Russian propaganda suggested a US drone was responsible for the bombing – which was the total opposite of the previous version, but it does dovetail with recent fears of US overreach with drone warfare. But photos from the site showed the tails of OFAB 250-270s, Russian-made bombs used by the Syrian and Russia air forces and not used by NATO forces, sticking out of the wreckage. Russia’s domestic media immediately created more theories, first saying that it was Assad, then that it wasn’t, that it was a US plot, that it was the Syrian rebels. One even suggested there was no convoy in the first place, and that the whole story was a conspiracy against Russia. Then, alternative outlets picked up the story from there – one said it was the White Helmets. Do you feel your head swirling already? That’s exactly the point! You are witnessing the birth of conspiracy theories. Since they’re being made up on the run, they contradict each other, creating chaos and confusion. Amateurs will take them up, weave them together, and produce new material Russian propaganda machine can use later. In the meantime, specialists in Moscow are probably already working on the “official” deceptive story, which will be much more airtight. We’ve seen this before: on 17 July 2014, civilian airliner MH17 was shot down by a Russian Buk, operated by Russian servicemen invading Ukraine who were aiming for a Ukrainian military plane. But to obscure the facts, Russia produced multiple conspiracies. 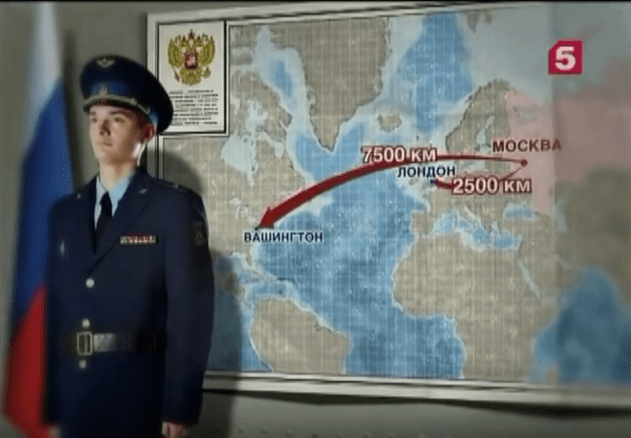 Days after the crash Russia’s Ministry of Defense planted two theories that would later be regurgitated many times over: that it was either a Ukrainian plane or a Ukrainian Buk that shot down MH17. For this, it on 21 July 2014, it produced faked satellite images of a Buk that bellingcat proved were taken at least one month before the launch, and on 21 July 2014, fake radar data purporting to show a a Su-25 warplane 3-5 km from the civilian airliner. The Joint Investigation Team report later on showed that this was impossible and that the distance between the closest aircraft and MH17 was approximately 30 km. Someone in Moscow even edited Wikipedia to make you think that SU-25s fly at the same altitude as airliner MH17 (which they don’t); and to make you think that Russia doesn’t use that same type of missile anymore. Too bad Putin took a photo right next to it at a Russian military base in Armenia. The same rocket was displayed at a military parade in Chita, Russia, on 9 May 2015. And other theories flooded the landscape. The Joint Investigation Team confirmed conclusively that MH17 was shot down by a Russian Buk, but Russia is still trying to sow a seed of doubt, accusing the investigation of bias, and that it’s all a conspiracy against Russia. Rapid fire conspiracy theories distract people at the early stages of the story, concealing the most obvious and damning version of events. Luckily, these conspiracies are produced so fast, there’s no time for a credible theory, and with the help of investigative journalists the truth will come out. Russian propaganda can be confusing. The fakes and manipulations are endless, often outrageous, and differ depending on their target audience. 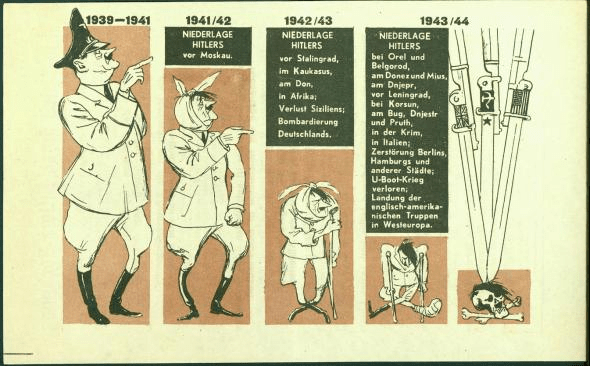 Russian propaganda for Russians differs from Russian propaganda for Ukrainians, Americans, Germans, or Georgians. With all the crazy fakes, it’s easy losing track of what this coordinated hostile information campaign is pursuing altogether, which makes finding the proper reaction more difficult. It needn’t be so. Russia’s Minister of Defense Sergei Shoigu has called mass media “but another arm of the armed forces.” Russian state-controlled media and social media trolls are serving the government’s military interests, pursuing strategies that have been developed by the Soviets during World War II. It’s easier understanding them if you knows how media operate by law of war. But in fact, Russia is at war not only with Ukraine, but also with the West. And so is its media. 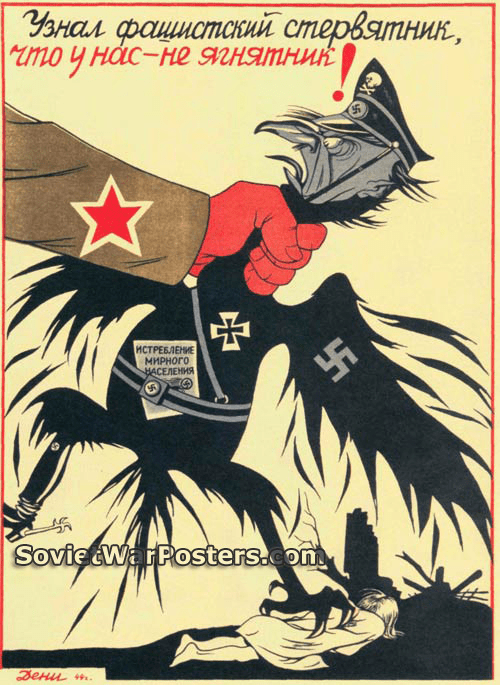 To help their own side win, during World War II the Soviets raised the battle spirits of their side and created an image of the enemy. They raised the battle spirits of their own to increase confidence and send the message “we are strong.” As a result, soldiers were encouraged and emboldened to kill more of the enemy and capture territory, and the home front, with lifted spirits, supported the action on the battlefield. Today, Russia raises the “battle spirits” of Russians in massive military parades featuring nukes, in PR campaigns threatening nukes in response for sanctions, and in TV shows showing playful plans to invade Europe and nuke the UK and USA. As a result, Russians support their authoritarian leader, strong country, and valiant army which is engaged in at least two conflicts on the ground, in Syria and eastern Ukraine. So what if the world is against us, so what if life is lousy. We are a strong nation and we will win. 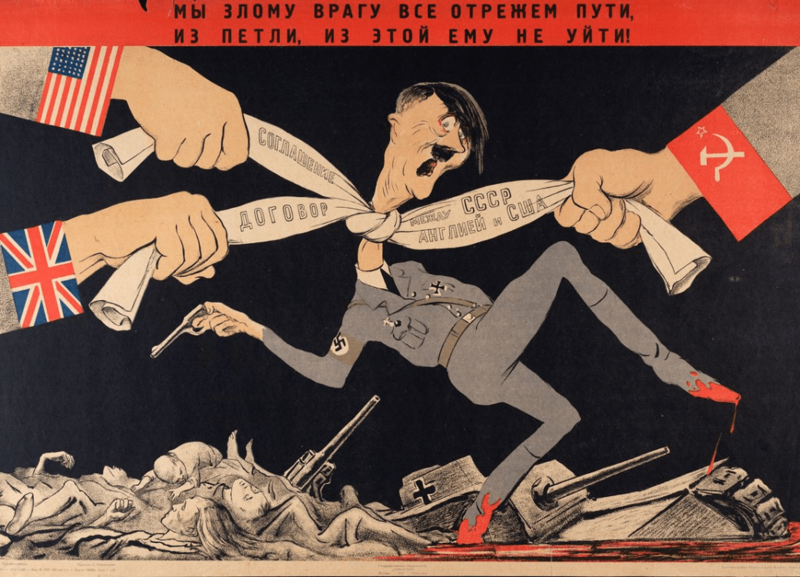 During WWII, the Soviets created the image of the enemy to make killing easier for soldiers by removing moral restraints. The enemy was shown either to be evil, devious and nefarious, provoking anger, or, conversely, ridiculous, to provoke scorn and make killing the enemy not as scary. 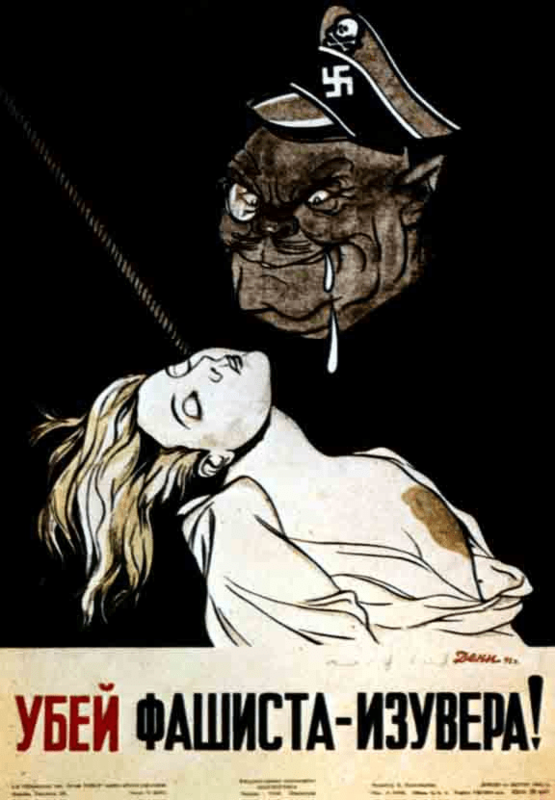 Often, the enemy is dehumanized and shown as an animal or monster. This, too, is intended to drive up hate and scorn, remove moral restraints, and facilitate killing. Today, this is being used in Russia’s hybrid war against Ukraine. Like this staged video purporting to show Ukrainian soldiers crucifying and burning a Russian-backed militant, with the goal of portraying Ukrainian soldiers as inhumane creatures, and keeping up the feeling of rightful rage which gives Russia’s hybrid army the motivation to either go to Ukraine and kill people who are very similar to them, or take up arms and fight against compatriots molded into an enemy. 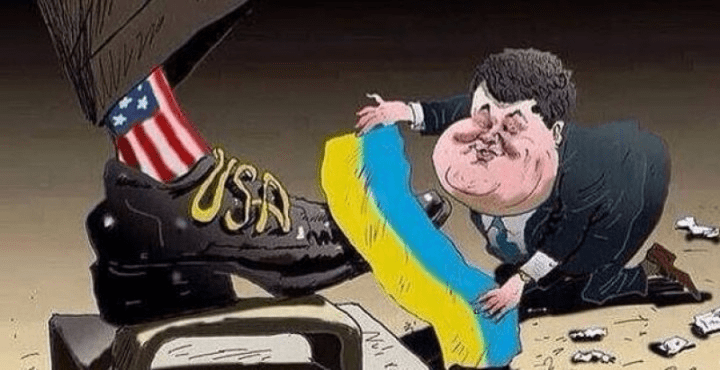 But since Russia tells its citizens that its real “enemy” is the “evil West”, particularly the USA, Ukraine is portrayed as only its puppet state, until recently personified by Barack Obama. 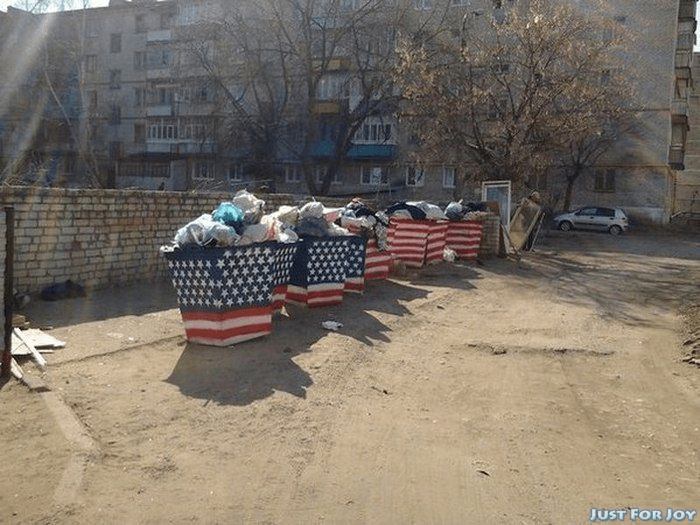 The USA is mocked and demonized in Russian propaganda. So is the EU: it is shown to be either aggressive and interventionist, or decadent and falling apart. 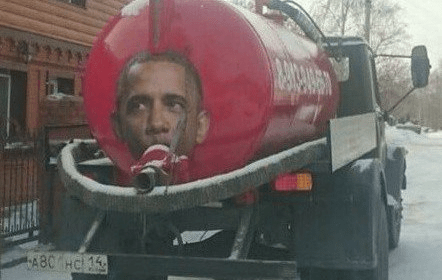 These memes give Russians the image of an enemy to hate. 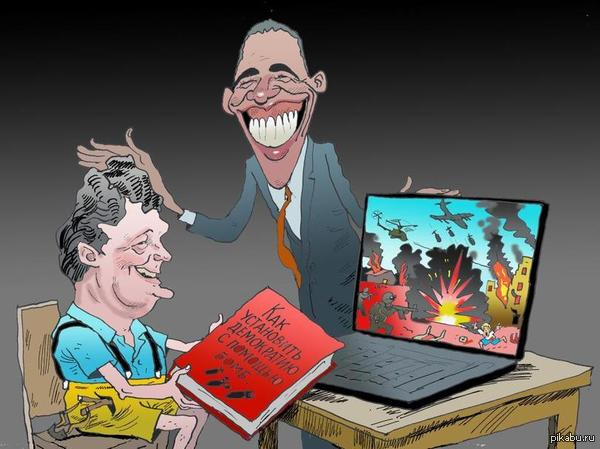 Ukraine, because they are at war with Ukraine, the USA which is shown to be its evil puppetmaster, and the EU. Similarly to the images of the enemy during World War II, the enemy is either devious and all-mighty, or ridiculous, weak, and falling apart. Memes are a convenient visual representation of a narrative prevailing in Russian news and opinions. Russians are being taught to hate the West via these narratives. 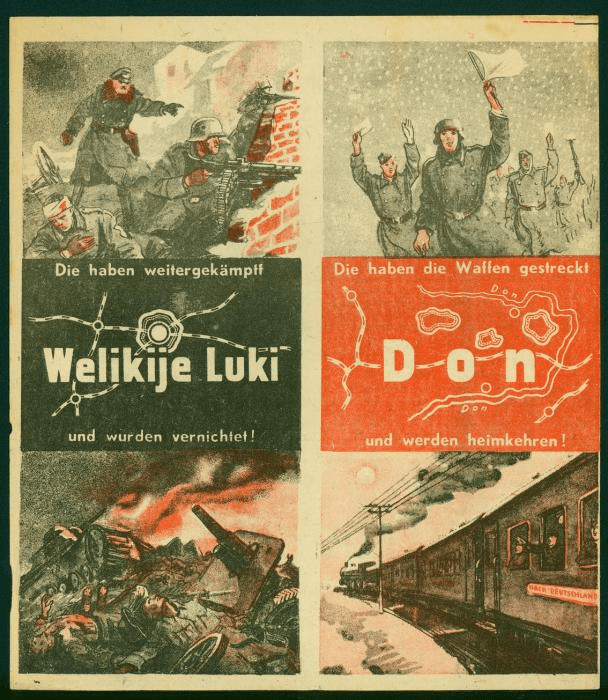 In WWII, the Soviets created propaganda for Germans that aimed to create divisions, destroy unity, and alienate people from the leadership, convince them that they are doomed to fail, and urge them to capitulate to the benevolent enemy. Today, Russia’s hybrid war is different from WWII. It’s a war on democracy. 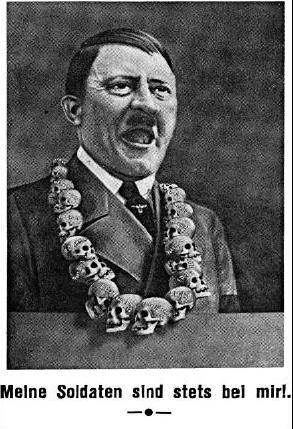 But its propaganda messaging uses the same tactics. It aims to weaken and destabilize the West, undermine the public discourse by providing a warped view of the world, where Russia can do no wrong, and the USA and EU are corrupt dystopias that are tearing themselves apart. It achieves this by exacerbating existing divisions or creating new ones. In Ukraine, Russia tries to persuade Ukrainians their choice of Eurointegration was a mistake and there is no alternative to returning under Russian hegemony. 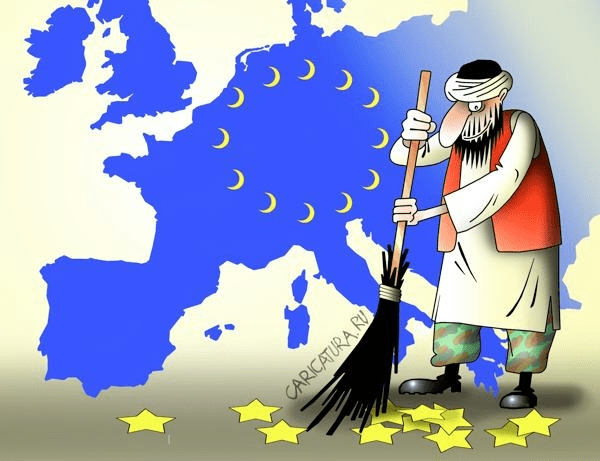 In the EU, pro-Kremlin outlets try to convince that the Union is doomed and should disintegrate, fulfilling the Kremlin’s dream of a weak and divided Europe, persistently implying that Europeans need to be afraid – of Muslims, of migrants, of their leaders, which opens the door to populism while closing it to reasonable debate. It also tries to justify Russian aggression abroad and increasingly totalitarian policies at home, implying that Russia’s occupation of Crimea, Russia’s claims to Ukraine, and Putin’s crackdown on his own citizens should be accepted. Both in Ukraine and the EU, Russian propaganda aims to create divisions, destroy unity, and alienate the people from the leadership. In Ukraine, it incites Ukrainians to overthrow its post-Euromaidan leaders in a “Third Maidan” and suggests that the EU has ignored Ukrainians’ European aspirations and abandoned them, while in the EU it undermines trust in leaders, stokes up fear, anger, resentment, sending the message that the existing leadership doesn’t represent the people’s interests and must be overturned. 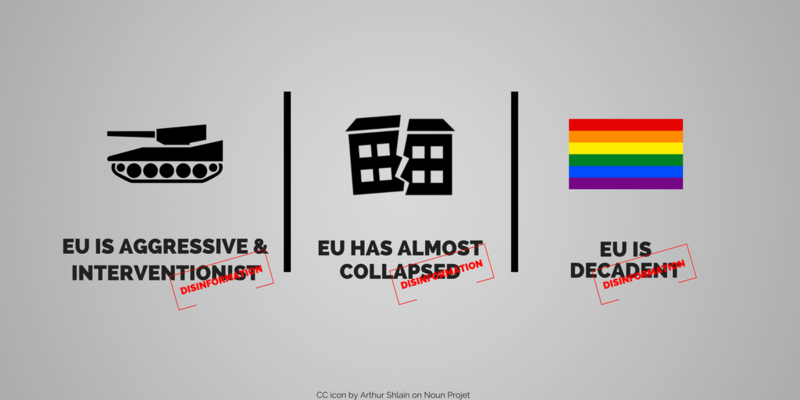 Here are some examples of Russian propaganda from all the categories we mentioned, courtesy of the collection of disinformation of EU vs Disinfo. NOTE: These are all titles of fake news reports, conjured to create a false image of reality. 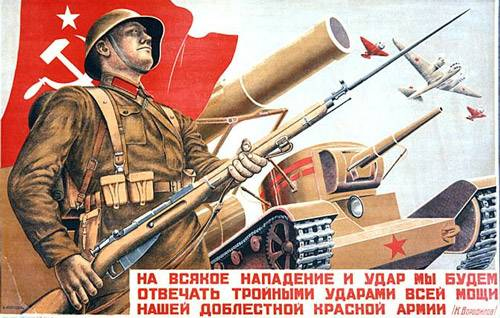 Soviet victory in WWII was “a symbol of the highest achievement of historical Russia in its confrontation with the collective West”. Note. While Russia aims to create divisions and discord in all its targets, items B & C are reserved for societies with links to Russia, which had been under Russian rule and have made steps towards the West. Remember: pro-Kremlin media in your country use war tactics to help the Kremlin win and the West lose. Don’t be duped. Check your facts. An interesting discussion on propaganda in general. You just have to shift Russia and put U.S. in the same place and you’d have the same tactics. That is the nature of propaganda. Indeed. It works the same in any country, with any government, and any people. I can’t really identify sources here, other than the impeccably unbiased sources Euromaidan Press and Stratfor (s/). Is this meant to be Onion-like satire? ?